Get rid of the CrashReport window. Is there a better alternative to CrashReport Killer? Is CrashReport Killer really the best app in Editors category? Will CrashReport Killer work good on macOS 10.13.4? OS X applications crash for random reasons. When they do we get the "CrashReport" window. 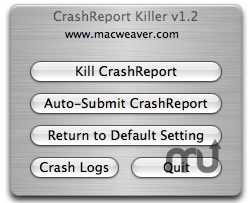 CrashReport Killer gets rid of the CrashReport window completely or it can be configured to automatically direct you to a crash submission form. Added ability to view crash logs. CrashReport Killer needs a rating. Be the first to rate this app and get the discussion started!